If Heidi is alive, she's in this sky-high corner of the Swiss Alps, with cowbells ringing on breathtaking ridges. After settling into a traditional village where locals scythe hay by hand, we hike and bike. We blast an alphorn, get sprayed by waterfalls raging deep inside a mountain, and savor local cheese at 10,000 feet. For a finale, we ride Europe's highest railway up the mighty Jungfrau for hot cocoa, glacier sledding, and oh-wow views. Esther rents seven clean, basic, and comfortable rooms, three of which have private bathrooms and share a generous lounge and kitchen. Urs and Dana also rent two five-person apartments with kitchenettes next door. Maria and Olle Eggimann rent three rooms — Gimmelwald's most comfortable and expensive — in their quirky but alpine-sleek house. Having raised three kids of their own here, Maria and Olle offer visitors a rare and intimate peek at this community. Two rooms with shared bath are upstairs, while the "double" with private bath is a ground-level studio apartment with a kitchenette and a private entrance. The Schilthornbahn cable car carries skiers, hikers, and sightseers effortlessly to the nearly 10,000-foot summit of the Schilthorn, where the Piz Gloria cable-car station awaits, with its solar-powered revolving restaurant, shop, and panorama terrace. At the top, you have a spectacular panoramic view of the Eiger, Mönch, and Jungfrau mountains, lined up on the horizon. If all the waterfalls have you intrigued, sneak a behind-the-scenes look at the valley's most powerful, Trümmelbach Falls. You'll ride an elevator up through the mountain and climb through several caves (wet, with lots of stairs, and — for some — claustrophobic) to see the melt from the Eiger, Mönch, and Jungfrau grinding like God's bandsaw through the mountain at the rate of up to 5,200 gallons a second (that's 20,000 liters — nearly double the beer consumption at Oktoberfest). Now run by Englishman David, Pension Gimmelwald is an old, low-ceilinged farmhouse converted into a family-style inn, with 10 simple shared-bath rooms, 2 rooms with private bath, a restaurant, and a cozy bar. Aside from the rooms, they have a 6-bed dorm rented out by the bed (which attracts more mature guests than a youth hostel). Its terrace, overlooking the Mountain Hostel, has gorgeous views across the valley. Though Fritz Hutmacher died in 2011, his wife Susi still runs their hotel, which offers a sun terrace, 24 rooms, four apartments for longer stays, and lots of thoughtful touches. The literal high point of any trip to the Swiss Alps is a train ride through the Eiger mountain to the Jungfraujoch (the saddle between the Mönch and Jungfrau mountains). At 11,333 feet, it's Europe's highest train station. (If you have a heart or lung condition, you may want to check with your doctor before making this ascent.) Keep in mind that you can enjoy the Berner Oberland without taking this trip — it's long, slow, expensive, crowded, and cold. But if the weather's good and you have a spare day and spare cash, the views are exhilarating — and it's fun to be up on a snowy glacier in midsummer. Visiting the Jungfraujoch takes up most of a day. The trip up from Lauterbrunnen takes a little under two hours each way, with a change of trains halfway at Kleine Scheidegg. If you're coming from Interlaken, Gimmelwald, or Mürren, add another half-hour. You'll want at least 1.5 hours at the top — more if you eat, hike, or sled. Expect outdoor temperatures to be around freezing in summer. If it's cloudy, skip the trip. Hi, I'm Rick Steves, exploring more of the Best of Europe. This time we're high in the Swiss Alps. From the lush valley floors to the tips of these peaks, we'll share the story of the Swiss people and their breathtaking land. Rather than tackling a checklist of famous Swiss mountains and resorts, I like to choose one area and savor it — this time, it's a region called the Berner Oberland. We'll see lots of awesome peaks, and we'll also get close to the Swiss culture — in a land where traditions meet the modern world and survive. We'll see great peaks — but this isn't just any Alps show. We'll make cheese the old-fashioned way, enjoy some traditional music, meet children in a one-room schoolhouse, learn some Swiss military secrets, pet cows in a traffic-free alpine village, feel the raw power of nature hard at work in these mountains, and climb to a spectacular view from atop the Alps. 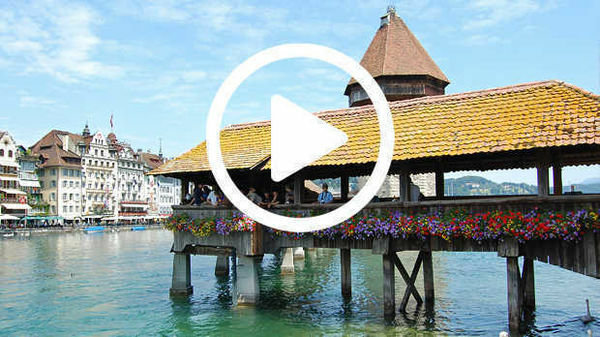 Switzerland is embedded in the center of Europe and is its most mountainous country. We'll explore the thrilling best of the Alps — in a region called the Berner Oberland. From Interlaken, two valleys lead south: touristy Grindelwald and quieter Lauterbrunnen. From our village home base of Gimmelwald, we'll ride lifts up the Schilthorn and Jungfrau. For the Swiss, the Alps are a marvelous playground — winter or summer, rain or shine. And they've made many of the most exciting spots easily accessible by train or lift. For this episode, we park our car once and rely entirely on public transit — like this. 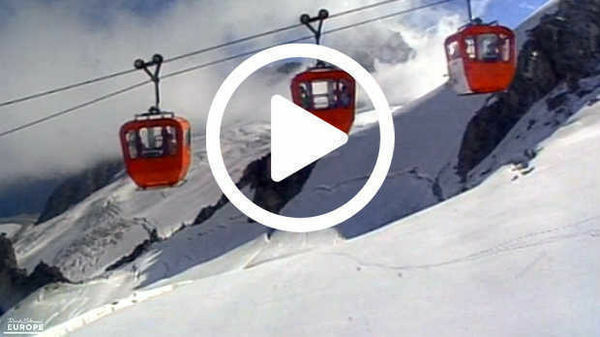 Part of the fun — and much of the expense — of enjoying the Alps is riding the various lifts. Whether you're riding cogwheel trains, steep funiculars, or gondolas, the views are breathtaking. This gondola drops us in the traffic-free village of Gimmelwald. This tiny intersection is the heart of downtown. On a sunny day, you understand why people say, "If Heaven isn't what it's cracked up to be, send me back to Gimmelwald." The village — established in the Middle Ages, incredibly on the edge of this cliff — was one of the poorest places in Switzerland. Its traditional economy was stuck in the hay. Its farmers make ends meet only with help from Swiss government subsidies — and by working the ski lifts in the winter. Modern tourism has perked up the local economy as well. The village operates like a big family. In fact, most of the 120 residents have the same last name: von Allmen. Collecting grass to get their cows through the winter in this rugged terrain is labor-intensive. Each hardworking family harvests only enough to feed 15 or 20 cows. Life can be tough, but they'd have it no other way. A generation ago, developers wanted to turn Gimmelwald into a big resort town. The villagers thwarted those plans by getting the entire town declared an avalanche zone. From that point on, no one could get permission to build anything bigger than a house or a barn. Unlike neighboring resort towns, Gimmelwald remains a vital community of families — locally owned and proud of it. Most of the buildings house two families and are divided vertically right down the middle. The writing on the post office building is a folksy blessing: "Summer brings green, winter brings snow. The sun greets the day, the stars greet the night. This house will keep you warm. May God give us His blessings." The oldest building in town dates from 1658. Study the log-cabin construction. Many are built without nails. Gimmelwald has a strict building code. For instance, shutters can only be natural, green, or white. The stones on the huts are there to keep the shingles from blowing off during strong winter storms. Farmers hang big ceremonial cowbells under their eaves, waiting for that festive day in the spring when the cows move from their barns up to the high meadows. Gimmelwald's accommodations are rustic — a couple of simple pensions, B&Bs, a hostel, and even a barn that hikers sleep in when the cows are in the high meadow. If you want a fancy bed, you're better off in a nearby resort. It's fun to buy produce directly from Gimmelwald's entrepreneurial farmers — like Esther. Rick: Do you speak English? Esther: Yes, a little bit. Can I help? Rick: What do you have for sale here? Esther: We have Alp cheese, mountain cheese. We have, from our cows, beef jerky — salami sausage — but we make not here in the house. The cow goes to Interlaken, and the sausage and the dried meat come back. The sausage is 28 percent pork. But all is organic. We have an organic farm. Rick: OK. So, how much is the beef jerky? Esther: It's five francs. It's 100 grams slice. Rick: Beautiful, I'll have that. Esther: Thank you very much. Esther: Bye, have a nice day. The village's biggest building is the schoolhouse. And the teacher, Olle Eggimann, is giving us a look at alpine education. Olle: OK, Rick, come in. This is our classroom here. Here we have 17 children we teach — from seven to 16 years old. So we teach them all together in one classroom. My wife and I share the only teaching position in town. Each day starts with singing. Then the students settle into their respective studies. It's little Nicole's first week, so she's getting some extra attention. Nicole: …drüü, vier, füüf, sächs, sibe, acht, nüün, zää! Olle: Well, you know it's somehow like a family where we have children that are seven year old and sixteen years old. If we go skiing or hiking, the older kids, without even that I ask for it, they will carry the heavy luggage for them. So it's really, they take care of each other. Olle and his wife Maria are enthusiastic about the modern world — and they also respect the deep-seated local traditions. The students enjoy the best of both worlds. Olle: You know, education should prepare children for their life. And what is important? Here, it's important that they know to use the facilities we have, like computers. But more important, they have to learn how to write, how to read, to understand what they see. They have to learn several languages — at least English, French, German. And these are the basics of an education, and this will never change. Villagers are expected to serve as firefighters, and every few months — rain or shine — they suit up and have a drill. With the fierce Alp winds, many of these all-wood towns have burnt entirely to the ground. These remote villages have no option but to provide their own firefighters. And since many of the men are out in the fields, stay-at-home-moms play a key role. Gimmelwald has never had a major fire. I was told that the villagers, well aware of the proficiency of their firefighting team…are especially careful with fires. In the Alps, get an early start. The peaks are often clear in the morning and then cloud up. We're riding the Schilthornbahn to the top of the Schilthorn. The Schilthornbahn carries skiers, hikers, and sightseers quick and easy to the 10,000-foot summit of the Schilthorn, where the Piz Gloria station awaits with a restaurant, shop, and panorama terrace. The early ride is discounted enough to pay for a big breakfast in the revolving restaurant, which caps the summit. Breakfast comes with 360 degrees of ever-changing views. While lifts take you to the high points effortlessly, there's nothing like actually hiking. You can gain your altitude by lift and hike from a gondola station on a level trail. Trails are thoughtfully signposted. This sign points to eight destinations. Gimmelwald is 3 hours, 15 minutes to the left. These times are clocked by local senior citizens — a humbling thought. Mountain huts are stationed throughout the Alps — often a comfortable day's hike apart. You could hike from France to Slovenia, never come out of the mountains, and every night sleep in a hut like this. They provide simple meals, hot drinks, and cheap loft beds enabling hikers to enjoy serious hikes without carrying food, sleeping bags or tents. I love these hikes. While we're high above the villages, we're not too high for the cows or the goats. Take time to greet these tame alpine companions and listen to their random symphony of bells. Enjoy the wildflowers including, if they're in season, the much-loved edelweiss — a symbol of the Alps. Mürren. This is a typical Swiss resort community — peacefully traffic-free, with hikers in the summer, skiers in the winter, lots of big hotels, cliff-side terrace restaurants, and colorful shops with all the alpine trinkets. Mürren is also a good starting point for mountain biking, popular here in the Alps. Bike shop man: So, here's your bike. Bike shop man: Just stick on the roads with the bike signs and you'll be alright. Rick: Now, I've got about half a day. What's a good loop trip? Rick: Put it on the lift. Rick: Ah, right back into Mürren. Bike shop man: Don't forget to take a few pictures. Rick: I'll do that. Thanks a lot. Have a good day. Small service roads and well-marked intersections make biking easy. And since I'm using lifts to regain my altitude, most of my big loop ride is level or downhill. Signs indicate where bikers are welcome. This little road leads to the valley floor. Lauterbrunnen means "valley of loud waters" — an apt name. And today, the waterfalls are particularly robust. Of the many waterfalls, Trümmelbach is unique because it's actually inside the mountain and offers a behind-the-scenes peek at the power of nature in action. Your Trümmelbach Falls experience starts with an elevator ride. Then, after hiking through some cavernous tunnels, you emerge deep inside the mountain and high above the valley floor. You see the raging river grinding like God's bandsaw deeper and deeper into the mountain. The melt water from the region's top peaks — the Eiger, Mönch, and Jungfrau — thunders through this funnel-like gorge at the rate of over 4,000 gallons a second. Rolling on, my route takes me through a typical European campground. It's understandable why campgrounds are so popular here. Good ones are idyllically situated and come with plenty of rustic comforts: a well-groomed place to park your trailer or pitch your tent, great facilities, a small store and restaurant. And campgrounds often come with bungalows, offering cheap beds for those without gear. Nestled in the bottom of the valley is the town of Lauterbrunnen. Its central location makes it a handy hub from which to explore either side of the valley. From here, a funicular — which carries bikes as well as people — takes me straight up the mountain. Rick: Excuse me. How steep is this? Rick: Sixty-one percent! Kein Problem? Rick: Never? For one hundred years? This sure beats the stairs. And, from the top, a scenic lane leads back to my starting point in Mürren. Exploring this natural wonderland, you come upon great examples of how, in Switzerland, tradition meets the modern world…and survives. This water wheel — 150 years old but washed out in a recent flood — was rebuilt with its blade still powered by a mountain stream. Almost all of the timber in the mountain villages around here was cut by water-powered mills like this. Small-scale mills are slower and more labor-intensive than modern mills, but there's still a strong demand for this more expensive — but traditionally made — local product. Milk cows spend their summers munching the wild herbs and flowers in the high meadows. Their milk is destined to become the treasured Alp cheese, or Alpkäse. Alpine farms — doing their traditional work — welcome hikers and bikers for a peek at the cheese-making action. This farm is newly renovated to meet European Union standards. Failing to meet these would mean the cheese could not be exported. But still, traditional quality survives all these modern regulations. Each morning Veronika — a licensed and highly trained cheese maker — and her crew milk the cows and heat a copper vat of milk over a wood fire. As it slowly curdles, it's stirred at just the right temperature until the consistency is exactly how Veronika likes it. At just the right moment, she swings the vat off the fire, then quickly dredges the vat with her cheesecloth and packs the fresh cheese into frames. This process is repeated every day for 100 days here in the high country — a cow's udder knows no weekend. In the next hut, yesterday's cheese takes a two-day bath in salt brine, and, after a salty rubdown, it's marked "Alp Cheese" with a date and number, and set on a shelf to age. Each village takes pride in its own cheese. This hut is full of local Alp cheese. Rick: Ja, can I…well, I speak ein wenig Deutsch. Kann ich Alpkäse? Local: Ja gerne. Möchten Sie 'nen testen? Rick: Okay, so this is Alpkäse? Local: Ja, das ist Alp. Das ist der ober Alp. Rick: Suppenalp — just up here? Along with the younger Alpkäse, village cheese makers produce Hobelkäse — an older, stronger cheese aged for up to three years. It's named after the Hobel, or wood plane, that's used to cut it. Rick: Ah, that cuts different. So this is stronger? Rick: Es schmeckt sehr gut. And you can buy it by the wheel, wedge, or wafer-thin slice to take with you on a hike. They say the character of the Alp cheese is shaped by the herbs and flowers the cows munch. Some locals claim they can tell in which valley the cows grazed just by the taste. I can't…but the taste is great. Mmm that's very good. The only restaurant in town is at the Gimmelwald Pension — a mom-and-pop affair serving basic but tasty alpine cuisine. The menu, which offers local organic produce, changes with whatever the farmers are producing. Liesi: How is your dinner? Rick: Very good. Tell me about this sausage. Liesi: This is organic veal, Bratwurst sausage from here. From Gimmelwald. Rick: Now the fondue here. What kind of cheese is here? Liesi: Mixed cheese. With Gruyère — from the French. With white wine. Rick: How do you do it? Liesi: You must stir in the bottom. Otherwise, you must clean the pot in the kitchen. Rick: I don't want to do that. Liesi: No? Okay. So work! I always enjoy a chance to hear traditional music — and up here, that starts with cowbells. Historically, yodeling and alphorns were a way for distant shepherds, farmsteads, and communities to communicate with one another. 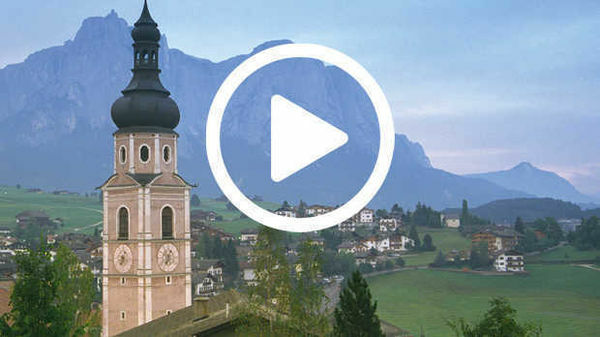 The long, legato, echoing tones just seem so right high in the Alps. For buglers, it's not that tough. You buzz just as you would when playing a trumpet. Since there are no keys, you get the same notes as a bugle. Needless to say, there was no request for an encore. Anyone visiting the Berner Oberland passes through the grand old resort town of Interlaken. The region's busy transportation hub, it's most useful as a springboard for alpine thrills. Interlaken's classic Old World hotels remind visitors of its glory days. In the late 1800s, when the painters and poets of the Romantic age popularized the wonders of these mountains, the Alps became a major stop for the wealthy on their grand tour of Europe. Interlaken became one of the original alpine resorts, and gracious hotels with ballrooms like this lined its main street. Interlaken's glory days are long gone, its elegant old hotels eclipsed by new, more jet-setty resorts. Today its streets are filled with shopping temptations. Monitors show live pictures of the visibility at famous peaks. If the TV screen shows the summit is socked in, you can choose from some interesting lowland options. In the 20th century, Switzerland — famous for its neutrality — became an alpine fortress, honeycombed with underground military installations. Behind this door hides an army hospital with several thousand beds. Anticipating an invasion, Switzerland had airstrips buried in mountainsides and pop-up tank barriers embedded in freeways. Every strategic bridge and tunnel — designed with explosives built in — could be destroyed with a moment's notice. My friend Fritz Hutmacher, who just finished 20 years in the army reserve, is giving away a few Swiss military secrets. Rick: So, Switzerland is famous for being neutral? Fritz: Yes. But over the last 70 years, the Alps got turned into a huge fortress. Now we have over 15,000 buildings like the ones around us with hidden guns. And even the neighbors they were not aware what was in, they were so secret. Rick: Fifteen thousand underground installations? Fritz: This barn looks like many others in Switzerland, but it hides a secret. Let's have a look inside. Rick: Wow, look at this thing. What was this for? Why did they have this here? Fritz: For World War II. It protected the fortress: the Alps. Rick: And was it used later than World War II? Fritz: Yes, it got updated over the last decades and has new technology in it. Rick: So, actually, this gun works? Rick: Now, children could have grown up outside these doors and not known there was a gun was sitting here? Fritz: Not only children. Generations were not aware what was actually inside these buildings. Rick: And this is not wood. It looks like wood. Fritz: No, that's solid concrete. In this town, four innocent-looking hay barns conceal a network of tunnels connecting several of these big guns. With the end of the Cold War, many of these once top-secret sites are now open to the public as museums. Rick: This is the gun we just saw? Guten Tag. Kann ich spielen? Rick: So, Fritz, from headquarters they would tell them what coordinates to set this on? Fritz: Yes, they would put the coordinates into that calculator, and the gun gets adjusted. A quick demonstration shows how the gun was prepped and loaded. Rick: This is not just a museum piece — it feels like it could still work. Fritz: Yes, if we had a live round, we could still fire it today. And these wooden houses look cheery and vulnerable from the outside…but, like nearly all modern Swiss houses, Fritz's family home sits upon a no-nonsense concrete bomb shelter. Fritz: This is the door to our bomb shelter. Rick: Oh, man. How much must this weigh? Fritz: A couple of thousand pounds — concrete and steel. Both: You all run in here. Swiss men are required to spend time in the military, including about 20 years in the reserve. And — like minutemen awaiting an invasion — they have their guns, gas masks, and ammo ready and waiting. While the Swiss may be ready for war, they seem most at peace with nature. From towns on the valley floor, a train takes tourists and adventurers alike to the region's ultimate perch — the Jungfraujoch. This breathtaking station sits like a fairy castle at 11,000 feet, between two of the region's highest peaks. The weather is usually better in the early morning — we're on the first train. Towering high above are the Jungfrau, Mönch, and Eiger peaks — named for the legend of the young maiden (Jungfrau) being protected by the monk (or Mönch) from the mean ogre (or Eiger). Continuing on, we change trains at Kleine Scheidegg, a rail junction at the base of these peaks. It has shops, rustic beds, and hearty food for hikers. This is the jumping-off point for rock climbers attempting to scale the foreboding north face of the Eiger. This train incredibly tunnels through the inside of the Eiger on its slow yet exhilarating climb to the literal high point of any trip to the Swiss Alps — the Jungfraujoch. Swiss engineers dug this tunnel and built this railway over 100 years ago. Why? Because they could…and for the viewing pleasure of those 19th-century Romantic Age visitors. Halfway up the Eiger, the train stops at panorama windows. Rock climbers can exit here into an unforgiving world of ice and air. After another short tunnel ride, you emerge at 11,000 feet — the top of Europe. Spectacular views of majestic peaks stretch as far as you can see. Cradled among these giants, you understand the timeless allure of the Swiss Alps. An elevator carries you to the highest viewing point. From there, you can see Aletsch Glacier — Europe's longest — stretching 11 miles south towards Italy. The air is thin…people are in giddy moods. It's cold even on a sunny day. While the Jungfraujoch station calls itself the top of Europe, it's possible to venture even higher. There's a hut just up the hill, and I'm heading there for another view and some hot chocolate. Thanks for joining us. I'm Rick Steves. Until next time, keep on travelin'. Auf Wiedersehen. Olle: Together with my wife we share the teaching position.